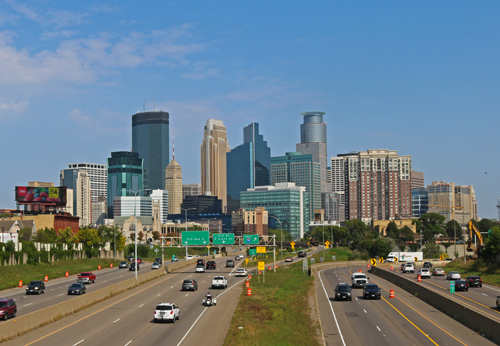 “Large swaths of our city are exclusively zoned for single-family homes, so unless you have the ability to build a very large home on a very large lot, you can’t live in the neighborhood,” says Minneapolis mayor Jacob Frey, reflecting on his city’s Minneapolis 2040 plan. Adopted this past December and aimed at tackling the city’s shortage of affordable housing as well as a legacy of economic and racial segregation, the plan calls for higher density housing along transit corridors and allows triplexes to be built across much of the city—including neighborhoods previously zoned exclusively for single family homes. That doesn’t stop folks from freaking out, though. The Minneapolis proposal first prompted pushback from a group calling itself “Minneapolis for Everyone” – whose support, despite the name, was concentrated in the whitest and wealthiest parts of the city where single-family zoning predominates. Nor was that the only irony, since a fair number of the group’s signs, with the slogan “don’t bulldoze our homes,” popped up in front of homes where the owner had previously demolished an older, modest home to make way for a much larger mansion (teardowns such as the one that recently made news locally as the “McMansion on Magnolia” are far more common in Minneapolis). And then there’s the fact that opponents decried Minneapolis 2040 as “a radical experiment in social engineering,” conveniently forgetting that single-family zoning is the single most successful social engineering experiment in American history, albeit with some troubling associations. New York had dabbled with height restrictions as early as the 1880s and Los Angeles became the first city to codify the separation of residential and industrial areas in 1908, but zoning in America didn’t really gain momentum until the Standard State Zoning Enabling Act of 1922 established the template for the zoning ordinances that, in many forms, survive to this day – including single family zoning (perhaps coincidentally, the Supreme Court had declared race-based residential exclusion ordinances unconstitutional some five years earlier). A version of this column was originally published here. By doing away with single-family zoning, the city takes on high rent, long commutes, and racism in real estate in one fell swoop. Matt lives in downtown Frederick with his wife and two children.He is a television writer, who works at home -- or anywhere else he can find good coffee and a Wi-Fi signal -- and whose credits include everything from children's cartoons to true-crime series such as A&E's "City Confidential" and "Snapped" on the Oxygen Network. He has a long standing and strong interest in urban planning, and has written about real estate, center city revitalization and historic preservation for a variety of publications.